A cleanroom is an environment, typically used in manufacturing or scientific research, that has a low level of environmental pollutants such as dust, airborne microbes, aerosol particles and chemical vapors. More accurately, a cleanroom has a controlled level of contamination that is specified by the number of particles per cubic meter and by maximum particle size. To give a perspective, outside would be considered about a 5,000,000 class clean room. Cleanrooms can be very large. Entire manufacturing facilities can be contained within a cleanroom with factory floors covering thousands of square meters. They are used extensively in semiconductor manufacturing, biotechnology, the life sciences and other fields that are very sensitive to environmental contamination. The air entering a cleanroom from outside is filtered to exclude dust, and the air inside is constantly recirculated through high efficiency particulate air (HEPA) and ultra low penetration air (ULPA) filters to remove internally generated contaminants. Staff enter and leave through airlocks (sometimes including an air shower stage), and wear protective clothing such as hats, face masks, boots and cover-alls. 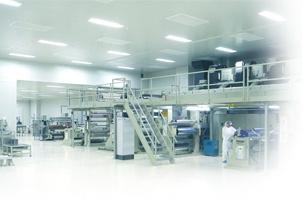 Equipment inside the cleanroom is designed to generate minimal air contamination. Common materials such as paper, pencils, and fabrics made from natural fibers are often excluded. Low-level cleanrooms are often not sterile (i.e., free of uncontrolled microbes) and more attention is given to airborne particles. Particle levels are usually tested using a particle counter. Some cleanrooms are kept at a higher air pressure so that if there are any leaks, the air rushes outside. This is similar to the lower pressure used in biological hot zones to keep the microbes inside. Cleanroom HVAC systems often control the humidity to low levels, such that extra precautions are necessary to prevent electrostatic discharges. Entering a cleanroom usually requires wearing a cleanroom suit. In lower grade cleanrooms, in which the standards of air contamination are less rigorous, entrance to the cleanroom can be without air shower. There is an anteroom, in which a special suits have to be put on, but then a person can walk in directly to the room.